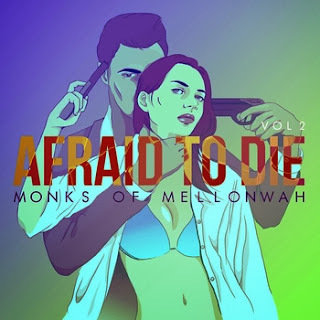 In an era where indie passes for mainstream Monks of Mellonwah bring back straight up riffs and singing to the hard rock world. The Australian 4 piece aren't reinventing the wheel (and at times can sound derivative) but the sound is solid, strong and assured on their newest 4 song EP Afraid To Die. Opening up with the title track the band seems to have taken a stab at writing a James Bond theme as the song swaggers and shakes with confidence, easily the best offered here. "Downfall" continues the riffs and overall feel of the disk before "Alive For A Minute" injects a theatrical feel to things as violins and drama overtake the song, zapping it of energy. EP closer "I Belong To You" is the requisite ballad a band like this seems destined to offer but the flute just pushes it to over the top sappy. The group is going a new release route (just like the Pixies) with their newest songs as they break their full length LP into 3 parts. This is the second with Ghost Stories having been released in June. We will have a lot more to say about this release style soon, but for now straight up hard rock fans should take note of Monks Of Mellonwah.